The true measure of life is in ones experiences. Powerful experiences are more enriching than material comforts. It's nice to have easy and comfortable access to beautiful places, but making a place more accessible can have the effect of taking the wild out of the wilderness experience. Experiencing true wildness will enrich a person and show in the depth of his or her photographs. As a child I was introduced by my father to the joys and challenges of hiking the back country wilderness. It was on one of these hikes that I came to believe that a place can project a unique aura. We had stopped for a moment to catch our breath after climbing a steep portion of the trail when my dad said "listen, the forest is completely silent!" There was no sound, no wind in the trees or sounds of birds or animals, not even distant atmospheric background noise. It was total silence. All I could sense was the beating of my own heart, and oddly I felt the forest was talking to me. From that moment I have tried to be sensitive to the personality of places I visit, and try to capture some of that spirit in my photographs. Most of my wilderness hikes have been with at least one other companion and usually on a well maintained trail system. There is a comfort factor with those conditions, but if visiting wilderness is made too easy and comfortable, it is less likely that the person will have a truly authentic and meaningful wilderness experience. One needs to be challenged to appreciate the true nature of wilderness. Recently on a late September morning I made a solo hike that required a bit of cross country route finding. 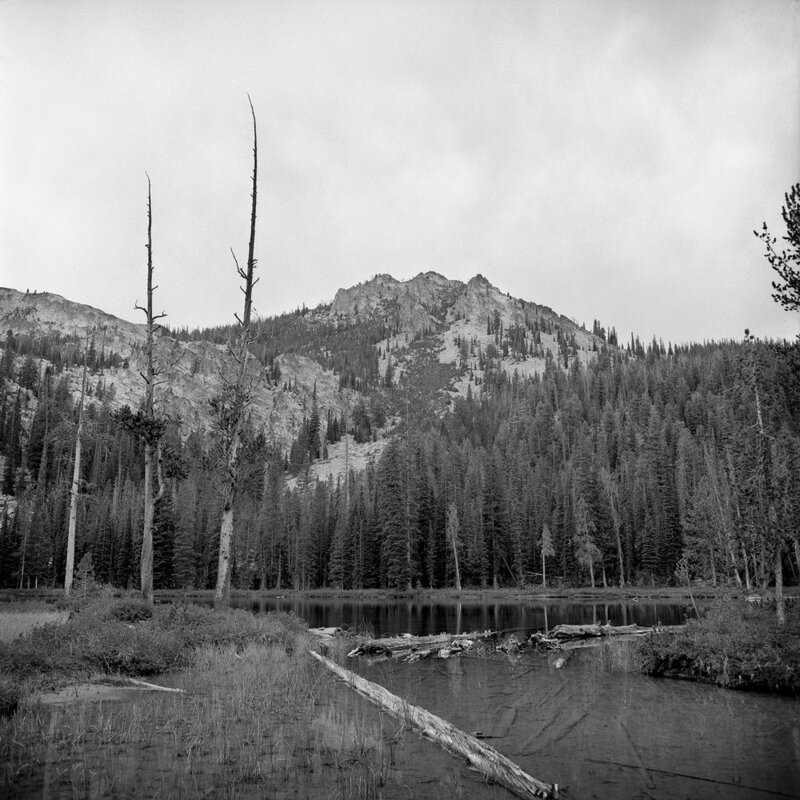 It was a journey to a high mountain lake system at the 9000 ft elevation in the Sawtooth wilderness of Idaho. My goal was the highest lake that sits just below the iconic face of Mount Heyburn. But this experience was different. I set out before dawn and for the first few miles the weather was calm and there was a well marked trail that ended at the first in a series of five lakes. By now the sun was up and the light was making the forest come alive. From there my destination required route finding through dense forest and scrambling up steep unmarked terrain to achieve the four higher lakes. And by mid day, as often happens in these mountains, the clouds began to move in and the weather became more threatening. At this elevation in September I knew that a storm could bring snow instead of rain. The combination of the deteriorating weather, the difficulty and uncertainty of my route, plus the fact that I was completely alone removed me from my comfort zone. As the dark clouds moved in I decided to cut my visit short and started back down the mountain. I knew if I could once again find the established trail before the storm arrived I would be in decent shape, which is exactly what happened. Just before I arrived back at the first lake it began to rain. Soon I located the trail and with it the relief of knowing I would get back down safely, even though I would be cold and wet. This experience gave me a real sense of accomplishment. I felt a deeper appreciation for this wilderness, much like I had years earlier with my father. There were moments of exhilaration, pride of accomplishment and contentment on the one hand, and uncertainty, confusion, even fear for my safety on the other. Whether or not it comes through in my pictures I will have to let the viewers decide, but I will long remember this day because of the physical and mental challenges I faced. I can't wait to do that again! Here are a few more images I made that day. 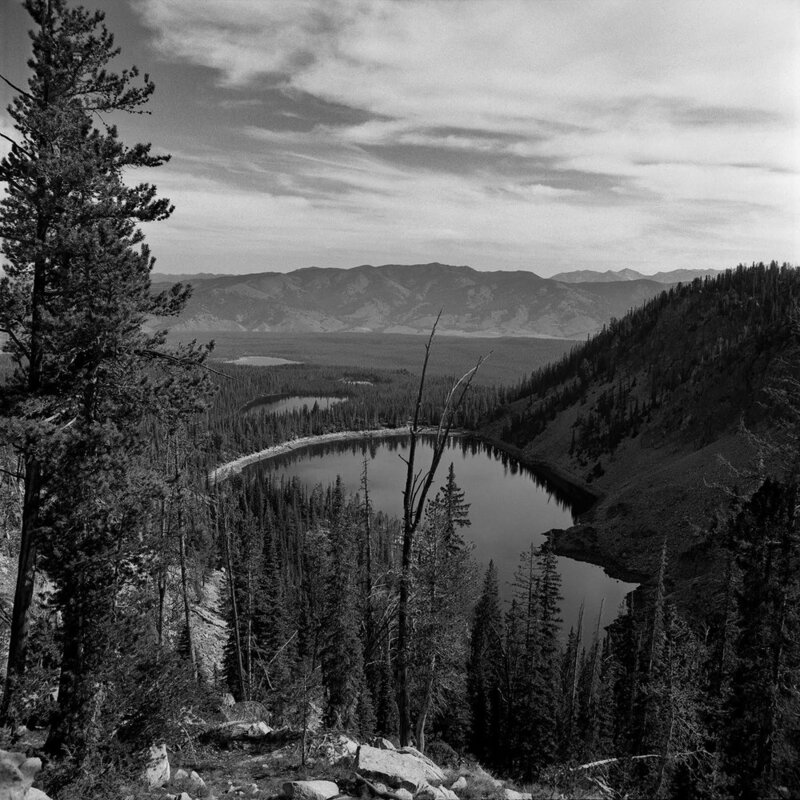 Film photographer Dan Bronson is based in Oregon. See more of his work on his website.